More than eight years ago I reviewed a 2-CD set of Mozart’s complete songs. The soprano was new to me then and I was enthusiastic about her beautiful, flexible voice and her expressivity. It was the young Belgian Sophie Karthäuser, already well-established in Mozart roles in Frankfurt and Brussels. That she was also an excellent Lieder singer was obvious from that Mozart collection and encountering her now in this Wolf recital confirms in no uncertain terms that early impression. She has developed into a tremendously accomplished artist. Wolf’s songs are not the easiest to get under the skin of, but her readings are utterly convincing. Wolf, the etcher among the Lieder composers, with all those finely-chiselled details, needs filigree work also from his interpreters and that is what he gets here from singer and pianist alike. Goethe’s Frühling über’s Jahr (tr. 8) is as good an example as any of this. Try to listen to this and you will be hooked. Then give Anakreon’s Grab (tr. 9) an airing and even more so the title song, Kennst du das Land, wi die Zitronen blühn? (tr. 10). These three songs cover all aspects of intelligent Lieder singing with nuances from ppp to fff and shadings of all kinds. The programme is cleverly built around settings of Goethe and Mörike, who more than any other poets inspired Wolf to his most sublime creations. The only ‘outsiders’ are Eichendorff and Reinick with one song each. Mörike’s Elfenlied has face, which is another important aspect of Lieder singing. Wolf may be less immediately accessible than Schubert, Schumann and Brahms and to convince new listeners of his greatness he needs sympathetic advocates. That’s what he gets in Sophie Karthäuser and Eugene Asti. Jaded collectors with shelves bending under CDs by Karl Erb, Elisabeth Schumann, Hans Hotter, Elisabeth Schwarzkopf and Dietrich Fischer-Dieskau may wonder what the fuss is about. I already have the best. That said, listen to how Sophie Karthäuser transforms the oft-heard and recorded Eichendorff setting Verschwiegene Liebe (tr. 17). I also have those ‘oldies’ – and several others – and frequently return to them, but Karthäuser touched me so strongly. I have mentioned just a few of the songs but I could name every track as a model of insightful Wolf singing, but those mentioned are enough to convince a sceptical reader of the excellence of this disc. The recording is faultless, there are good liner-notes and – which can’t always be taken for granted these days – we get full texts with translations in French and English, which further enhances the quality of the disc. 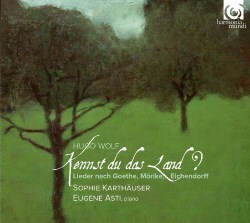 It should be heard by every Lieder enthusiast.